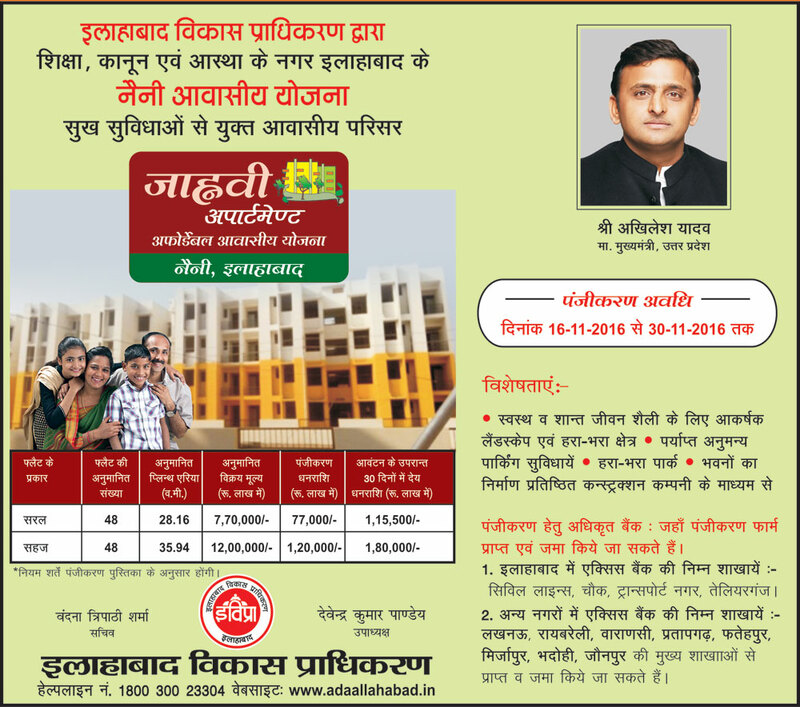 ADA Allahabad Jhanvi Apartments Naini Awas Yojana Scheme 2016 for 96 Flats. The scheme for the allotment of new flats under the affordable housing Scheme initiatives of the government. Registration under the scheme starts from 16 November 2016 and the last date is 30 November 2016. Registration under the Jhanvi Apartments Naini Awas Yojana Scheme 2016 for 96 Flats scheme starts from 16 November 2016. The scheme for the allotment of new flats under the affordable housing Scheme initiatives of the government. A total of 96 flats are on offer under the scheme. The scheme provides for 2 types of flats named as ‘Saral’ and ‘Sahaj’. The plinth area under the two types of flats is approximately 28.16 sq meter and 35.94 sq meter, respectively. 48 flats each are available under each of the 2 categories. Registration amount payable at the time of application is about 10% of the estimated cost of the respective size flats. The scheme boasts of green landscapes, ample parking spaces, lush green gardens and development by a reputed construction company. Jhanvi Apartments Naini Awas Yojana scheme is open to all and can be applied for by registering through an application form that can be procured from select branches of Axis Bank. Forms can be procured and then deposited along with the registration amount at any of the following branches before the deadline of November 30, 2016. Axis Bank Branches in Other Locations: Lucknow, Raibareilly, Varanasi, Pratapgarh, Fatehpur, Mirzapur, Bhadohi and Jaunpur. Scheme is open to all.